Sea turtles live in the warmer oceans of the world. They have been in the oceans for about 230 million years – since before the dinosaurs. These ancient sea creatures are among the most endangered animals on the planet. Sea turtles feed on jellyfish, seaweed, shrimp, crabs, algae and small molluscs. The green sea turtle (Chelonia mydas); is a large salt water turtle with a wide distribution throughout the tropical and subtropical regions of the world. Adult green turtles are unique among sea turtles in that they are herbivorous, feeding primarily on seagrasses and algae. This diet is thought to give them greenish colored fat, from which they take their name. The green sea turtle is an endangered species. Their populations have drastically declined in the last 50 years. Their meat and eggs are highly prized and eaten in some countries; they can drown when caught in fishing nets or die after eating trash such as plastic bags that they see as jellyfish. Green sea turtles are distributed throughout the Pacific from Alaska to Chile in the eastern Pacific, and from Russia to the northern coast of New Zealand in the western Pacific. Major Pacific populations are on the northern coast of Australia, Southeast Asia, Hawaii, and Mexico. “Traditional’ hunts were not only exempt from laws to protect endangered species, but in Queensland are also exempt from laws protecting animals from cruelty — allowing turtles to be carved up whilst still conscious and dugongs to be dragged for many minutes by boat, with their head under water, until they drown. Thanks to the efforts of Animals Australia and other wildlife supporters the Queensland government has removed animal cruelty exemptions for ‘traditional’ hunting of turtles and dugongs. This is a huge win for turtles and dugongs in Far North Queensland, who will now be fully protected under the Animal Care and Protection Act and spared the suffering caused by cruel ‘traditional’ hunting methods. As well as threats from disease, entanglement, illegal fishing and by-catch, the marine turtles’ nesting beaches in northern Australia need urgent protection from predators and marine debris. Sir Paul McCartney has lent his support to WSPA’s Stop Sea Turtle Farming campaign. The campaign launched on Monday 15 October and aims to save sea turtles from being cruelly farmed for food in the world’s last commercial farm. Some 7,000 endangered sea turtles – accurately portrayed in Finding Nemo as peaceful animals that travel thousands of miles across oceans – have been effectively immobilised and stockpiled in filthy, tiny tanks for so long that they have begun to cannibalise each other. Australia’s world leadership in marine conservation was rightly recognised in 1975 and 2004 with the establishment and extensive rezoning, respectively, of the Great Barrier Reef Marine Park. The 2007 and now the 2012 Commonwealth marine protected areas are a big step backward from the 2004 milestone. In the Coral Sea Marine Reserve, for example, there is only a marginal reduction in pelagic longline fishing, which impacts protected shortfin mako sharks and turtles as well as the overfished big eye tuna. The Great Barrier Reef is in crisis and without decisive action by the Federal government and Queensland State government Australia could be placed on UNESCO’s ‘list of shame’ for not meeting its World Heritage obligations. Gladstone fishermen confirm the problems continue. Fishermen report that there have been intervals between fish kills, but turtle deaths are still occurring most weeks. Last September, La-T-Four, a young green turtle, was found washed up and in agony on a lonely stretch of beach near Bowen, on the Great Barrier Reef. Too weak to swim or feed, La-T-Four was not far from death. She was just one of an estimated 1,800 turtles that have suffered the same fate in the past year. For vulnerable and endangered sea turtles in Australia, vessel strike is recognised as an important threat but its severity relative to other threats remains speculative. Documented evidence for this problem is available only in stranding records collected by the Queensland Environment Protection Authority. With the authority’s support we assessed the scope and quality of the data and analysed vessel-related records. 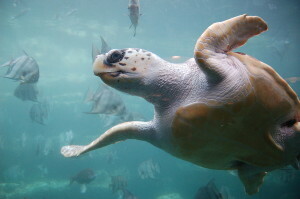 They found adequate evidence that during the period 1999–2002 at least 65 turtles were killed annually as a result of collisions with vessels on the Queensland east coast. It’s easy to imagine that many more were injured and left to suffer. Something is wrong on the Reef and turtles are paying the price. Turtle hospitals along the Queensland coast don’t have enough emergency tanks. Too many turtles are suffering. WWF need your help to provide up to 20 new emergency tanks for a number of Queensland’s turtle hospitals and rehab centres. Some oil exploration and drilling already occurs nearby to Western Australia’s Ningaloo Reef and is increasingly encroaching on the area. The reef is now surrounded by oil and gas exploration leases but most are yet to get approvals to undertake exploration or production. Western Australia’s peak environment and sustainability group the Conservation Council of WA welcomed a decision by the Federal Government to reject Apache Energy’s application to undertake seismic exploration within the Ningaloo World Heritage area. The timing of the proposal also coincides with the breeding season for endangered loggerhead turtles. Economic growth and exploration of natural resources continues to intensify with human population growth and depletions of energy. It means more ocean traffic, pollution, intense fishing, collisions and clashes with human demands.